Thermal packaging solution testing minimizes the risk to product quality during transit when completed properly. Our experience and expertise makes our company the best choice for your temperature sensitive packaging project. Many companies rely upon gh Package & Product Testing to qualify their packaging. We comply to industry standards with our testing. Our laboratory testing will provide the results that your packaging is capable of consistently operating within established limits and tolerances. We then provide a documented report that assure your packaging is effective throughout your shipping process. Our testing will provide documented verification that your packaging will withstand the rigors or truck, air or sea shipments. Our team works to provide quick turnarounds on physical testing in our chambers and recommendation for any design changes for your packaging. We understand that it is our job to provide value that will assist you in solving your packaging concerns. ghTesting provides a wide array of packaging testing services to assure that pharmaceutical products are packed in a way that will protect them in various shipping conditions. We know that pharmaceutical products must arrive safely and in a manner that will not adversely affect their eventual performance and characteristics. Our testing offers standard tests including drop and impact, vibration, thermal and climatic, compression, shock and package integrity in order to replicate all potential shipment problems. gh Testing operates nine climatic and environmental test chambers for supply chain testing. We are able to simulate most global shipping conditions that will affect consumer packaged goods as they find their way to their final destination. 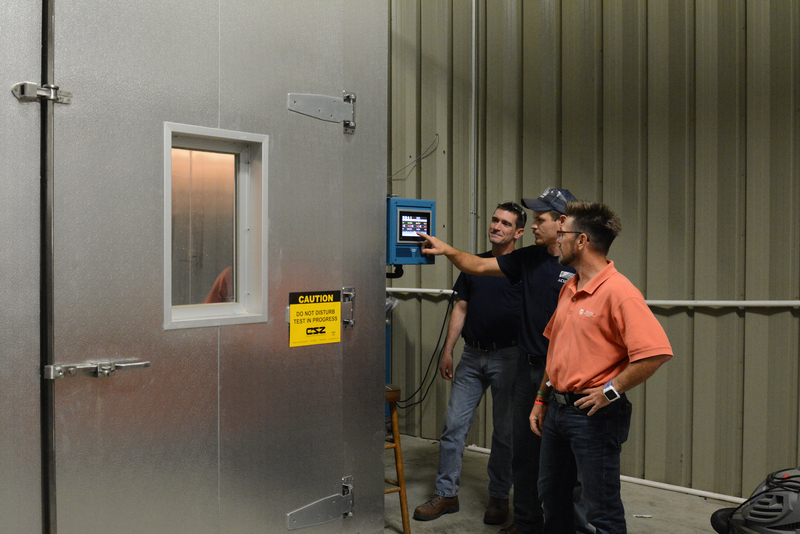 With many products being shipped around the world in a myriad of climate conditions, thermal testing is a critical test procedure to assure products arrive safely and in excellent condition. Why do you need to be concerned about environmental conditions? Think about what happens in a high heat and humidity warehouse, truck or shipping container. Poor corrugated material will absorb humidity and will cause weakness and deterioration. Eventually they will not be able to hold a stacked load. Unsafe conditions result and toppling can occur. Not a pleasant situation. Our conditioning chambers include capabilities for temperatures below freezing, high heat, low and high humidity with large drive-in for larger packs, taller stacks. This helps us determine the validity of a pack to withstand the environmental conditions imposed during shipment.